This Newbery Honor-winning book shows us that in the steady courage of a young girl lies a profound strength that can transcend the horrors of war. 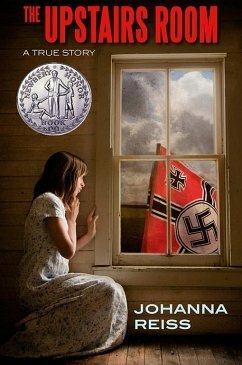 This is the true story of a girl's extraordinary survival during the German occupation of Holland of World War II. Annie was only ten years old, but because she was Jewish, she was forced to leave her family, her home, and everything she knew. Annie was taken in, far from home, by complete strangers who risked everything to help her. They showed Annie where she had to stay - the cramped upstairs room of their farmhouse. She would remain there while Nazis, who were ever vigilant, patrolled the streets outside. If Annie made even a sound from upstairs, or if a nosy neighbor caught sight of her in the window, it would surely mean a death sentence for her and the family that took her in. Elie Wiesel writes, "e;This admirable account is as important in every aspect as the one bequeathed to us by Anne Frank. "e; A Newbery Medal Honor Book, ALA Notable Book, and winner of the Jewish Book Council Children's Book Award. Be sure to read the moving sequel "e;The Journey Back"e; by Johanna Reiss.